Jeffyne Telson grew up in Dallas, Texas but has spent most of the last half of her life in California. 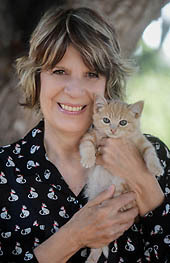 Although she has Bachelor of Arts degree in graphic design from Texas Tech University, she has devoted the last two decades to the pursuit of her real life’s passion…caring for stray and abandoned cats and kittens. In 1997, Jeffyne founded RESQCATS, Inc, as a non-profit organization dedicated to the rescue, care and adoption of stray and abandoned cats and kittens. In the ensuing 20 years, with the help of a small group of dedicated volunteers, Jeffyne has grown RESQCATS well beyond her dreams, into a highly respected rescue organization that has placed more than 2700 cats and kittens with qualified families and individuals. 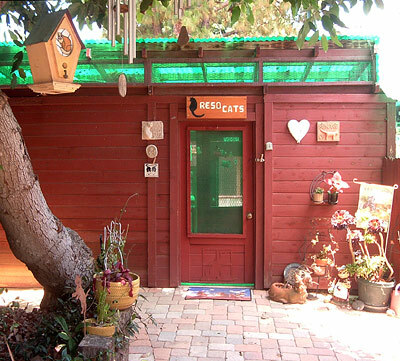 Today, in addition to being the President of RESQCATS, Jeffyne and her husband, Mitch, share their Santa Barbara, California home with 14 unadoptable cats, 6 collies and 15 giant African sulcata tortoises…all rescued of course! ~I love what you’re doing at RESQCATS. I am a volunteer with the Oregon Humane Society cattery and I know shelter work is both demanding and rewarding. Could tell a little about your hands-on working with the cats on a daily basis. How does it make you feel at the end of the day? At the beginning of the next day? Is Santa Barbara a no-kill region or are you fairly alone in your endeavor? There are no paid staff at RESQCATS and I do not draw a salary either. My days are dawn to dusk during kitten season…8-9 months of the year. I begin my days with hope and a desire to make a difference and end most days feeling great about the accomplishments of the day. Other days, when I lose one of my own animals or a kitten, I must remind myself by looking in the mirror at night and saying ” I did the best I could today.” Knowing when it is out of our hands is the key to being able to let go and move forward. I know that many (rescues and shelters) call themselves “No Kill” but I think that the term used by most organizations is not transparent and I take every opportunity to educate anyone who visits RESQCATS to inform them of that. Their definition of No Kill is the cats must be “healthy, social and 8 weeks of age.” If they do not meet even one of those criteria, they can be euthanized and the shelter can still call themselves No Kill. I think this is misleading the public…so I would say YES! I am pretty much alone on this endeavor since the unadoptable cats become resident cats. For example, I just took in a 17 year old cat that was turned in to a shelter. I kept three leukemia positive kittens almost two years ago…and they have all passed, so we have a new resident, Talulah, who is FELV positive. ~What do you consider your greatest accomplishment in the cat world? And your greatest disappointment? My greatest accomplishment is creating a safe, loving environment for stray and abandoned cats and kittens and providing any and all medical care that they need prior to adoption. I am especially proud to be a truly NO KILL sanctuary where any of the cats that are not adoptable can live out their lives. My greatest disappointment has always been with people…those who don’t understand that rescue is about who needs a home; not the color of the cat, or where its markings are or what color eyes it has. It is hard for me to see young moms passed over because so many people just want kittens…it takes a lot some days for me to try and put those prejudices from people aside. That is when I return to spend time with the cats and the purity of all that they offer to us. I see the world differently because of their lessons in acceptance and giving of unconditional love…no matter what color WE are, how we dress or how old we are! I agree, cats have a lot to teach us, if we would learn to listen. 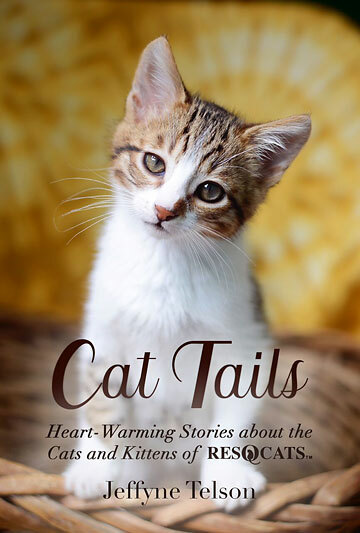 ~You recently published your first book, “Cat Tails: Heart-Warming Stories about the Cats and Kittens of RESQCATS.” Congratulations! Mystery writer Sue Grafton calls your book “…a touching account of Jeffyne Telson’s journey over the years with cats great and small.” Great praise. I began writing articles for the RESQCATS newsletter with the sole purpose of raising funds for the cats and kittens in our care. As the years passed, I found that writing about the cats and kittens was a creative way for me to share my feelings about rescue and its many challenges. I began to realize the valuable lessons that the animals taught me about life. 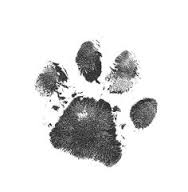 I also discovered that writing about the losses of some that could not be saved, as well as the grief I felt after losing my personal animals, was a path to healing. Putting pen to paper was a safe, less vulnerable way for me to express my feelings. For many years, a close friend encouraged me to write a book about my experiences because she loved the stories in the newsletters. I resisted the idea for years, but I thought about her request often. One day, I accepted the challenge and spent my vacation time for the next four years working on the book. What became most apparent when I wrote the book was not just that I had made a difference in the lives of hundreds of stray cats, but I discovered that the impact the cats had on my life was equally profound. If I touch the heart of even a single reader, then I feel I have accomplished my goal. 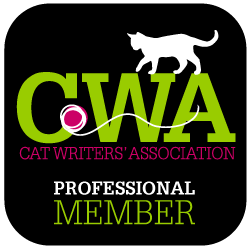 ~Like me, you are a member of the Cat Writers’ Association, demonstrating your true dedication to cats. How many cats do you have? Do they help with your writing? I have fourteen resident cats at RESQCATS, and three that live at a permanent home with a foster…most were not adoptable due to age, health issues or attitude! RESQCATS is responsible for their lifetime care. Wow! That sounds like a furry challenge. ~What five words would you use to describe yourself? Sensitive, compassionate, creative, kind, humorous! ~What is the most useful writing tip you’ve ever been given? To elaborate on a thought. I like that. I haven’t heard that one before. ~Tell us your favorite real or fictional cat story. Mollie, all the chapters in the book are real… I am not sure how to pick just one, but I will attach a few chapters. Thank you. I can’t include them all so I picked one that spoke to me, Chapter 18. For the rest, people will just have to get your book. Snowie arrived in the summer of 2001 with four adorable kittens. Just like their mother, they were pure white. At first glance, they all looked the same. But on closer inspection, I saw that they were each very unique…just like real snowflakes. I named them Snowball, Snowshoe, Snowman and Snowflake. Snowie was an attentive mother and loving mom. She nursed, bathed and tended to the needs of each kitten. She watched them explore the enclosure as tiny four-week-old babies. As they grew, she showed them how to eat on their own and use the litter box. They ventured onto the condos and ramps that led to an upper shelf. They played and entertained themselves for hours. As weeks passed, they became less dependent on Snowie. I knew that the kittens would be adopted very easily. Even in the early years of RESQCATS, I had heard more than enough times, “I only want a kitten.” Sometimes it seems like mother cats exist solely to supply kittens for adopters. Moms often go unnoticed during adoption appointments. As I expected, the kittens found homes as soon as they were old enough to leave their mother. That left only Snowie. So here I was once again, fretting about what to do with an adult mom. The vet estimated Snowie to be between two and five years old. She was exceptionally beautiful with a thick coat of flawless white fur. Her yellow-green eyes looked like autumn leaves just beginning to change from late summer green to autumn gold. She undoubtedly had good looks going for her. The problem was that Snowie was terribly shy. Even if she had been the kind of cat that just wanted to crawl into someone’s lap, finding a home for an adult in the heart of kitten season is never an easy task. Add timid and introverted to her resume and it became even more difficult to find an adopter. Most public shelters have an open-door policy. Potential adopters can come and go during normal business hours. On the other hand, RESQCATS operates by appointment only because the facility is located on my personal property. Potential adopters are pre-screened via a telephone interview. I “rake people over the coals,” so to speak, during the interrogation. They must agree to our indoor-only policy and promise to never declaw the cat. I also emphasize that they are making a commitment for the kitten’s lifetime, thirteen or more years. If all is in order, we set a visiting time. The advantage of an open-door approach is that cats are continually exposed to the general public. The more often they are seen, the more likely adult cats will find their forever home. Many people have a preconceived idea of what they are looking for when they visit shelters, but they may actually go home with something very different. I am not saying that does not happen at RESQCATS. However, in reality, most who visit are seeking a kitten. It is rare for adopters to leave with a mother cat when their objective was to adopt a baby. My sole intention for Snowie was to do my best to find a home for her in a timely manner. I felt there was a better chance for her to be adopted at a public shelter because she would have more contact with potential adopters. My hope was that someone would visit the shelter and become enamored with this stunningly plush, white cat. They would find her irresistible and, ultimately, take her home. A volunteer, Evie, offered to take Snowie to the shelter for me. I sent her with the important paperwork noting dates of her vet exam, vaccinations, spay surgery and other relevant information. I also prepared a care package with Snowie’s favorite food and a few toys. Much to my surprise, Evie was back within half an hour. She was distraught to the point of tears and said she had been treated rudely by the woman in charge at the shelter. The shelter manager had merely glanced at Snowie inside the carrier and abruptly blurted, “That cat has skin cancer and it will take six months to clear it up.” But Snowie’s vet exam had revealed no such condition! And Evie had done nothing to provoke such disrespect. I would like to think that the shelter manager was just having a bad day. Still, that was no reason to treat anyone in such an offensive manner. I became angry as Evie told me what had happened. The insinuation that I had sent Snowie to the shelter because of her medical condition was completely untrue. I got into my car and drove directly to the shelter. This was a matter that I would certainly clear up with the manager. At the same time, I planned to address the disrespect she had shown to my volunteer. Her rudeness was totally unacceptable. On the way I decided that with that kind of attitude, Snowie was definitely in the wrong environment. When I arrived, I had a stern, yet professional, conversation with the woman. I also brought Snowie back to RESQCATS! Fortunately, Snowie was adopted a few weeks later by a sweet, quiet, older lady who understood that Snowie was shy. She also realized that it may take a long time for Snowie to adjust to new surroundings. We had a lengthy discussion about how to introduce Snowie to a new home. She was to begin in a single room. The door to the room was to remain closed. Once Snowie was comfortable in that setting, it would be okay to open the door to the adjacent area. Determining how quickly to increase access to the entire house depended on how well she responded with each added space. As always with cats, it is on their own timetable! It had been less than a week when Snowie pushed out the window screen in her room and was gone. I was thankful that the lady called immediately to inform me about what had happened. However, I was afraid that the odds of Snowie returning through the same window were highly unlikely. The sweet lady realized that Snowie was not the right cat for her. If Snowie returned, she asked if RESQCATS could take her back. Fortunately, I was able to trap Snowie and return her safely to RESQCATS. Caring for a resident cat at RESQCATS requires an enormous financial obligation and emotional commitment. That being said, there was not a question in my mind that Snowie could stay at RESQCATS for her lifetime. One particular volunteer had grown exceptionally fond of her and was elated that Snowie would be a permanent tenant. She drew up a contract and handed it to me just one day soon after Snowie’s return. She pledged to provide Snowie with a lifetime supply of albacore tuna in water and her favorite toy…bouncy balls! The first years of Snowie’s life had been spent on the streets in sunny Southern California. At RESQCATS, she spent much of her time in the overhead outdoor tunnels that connect the main cattery building to outside enclosures. She enjoyed the warm sun beaming down on her outstretched body and fair-skinned face. As a precaution, we covered her favorite tunnels with shade cloth to protect her from skin damage. But Snowie sought out even the tiniest spot of bright sun to park her little pink nose and white ears. The cumulative exposure from years on the streets as a stray finally caught up with her. She was at RESQCATS less than two years when small scabs and sores appeared on the outer edges of her ears. Unlike the earlier claim by the shelter, this was the first sign of any skin issues. A vet exam confirmed skin cancer on Snowie’s ears. While we were in the exam room, I reminded the doctor that she had been treated for occasional eye infections. The prescribed antibiotics had not helped. He got out a special optic tool and looked closely at her eyes. “Yes, I see the problem now,” he said. “Her lower eyelashes grow inward.” The medical term for the condition is entropion. Every time she blinked, the tiny lashes scraped past her corneas causing irritation. Imagine it is like having a piece of sand in your eye that you cannot get out. If left untreated, her eyes could ulcerate. That could cause extreme discomfort and eventual blindness. He suggested that surgery to turn the eyelashes outward would fix the problem. The veterinarian presented two options to take care of the skin cancer. Neither was palatable. However, if nothing was done, the cancer would certainly continue to spread. The burning and itching would persist and make her miserable. The other option was to amputate the flaps of her ears and prevent future damage and suffering. Believing it was in Snowie’s best interest, I opted to have the surgery done. However, I did not truly comprehend the remorse I would feel. I will never forget visiting Snowie at the veterinary clinic immediately after her surgery. Sutures spanned the entire top of her head, well past where her ears had been. She had stitches under each eye that neatly tucked back the entropic eyelashes. I felt awful for what I had done to her. Snowie was prescribed heavy medication for her pain. The vet instructed me to continue the meds for several days. I was grateful that there was something I could give her to alleviate her discomfort. But there was no drug to help with the agony I felt for her suffering or my remorse for having put her through such trauma. I left the vet’s office in tears. Guilt weighed heavily on my shoulders. I knew that having her ears surgically removed was the right choice. But it would be years before I recognized that my decision for the surgery was all right with Snowie, too. I contacted the volunteers when I returned to RESQCATS and forewarned them about how pitiful Snowie looked. I also needed them to be prepared for her depressed state. I told them that the next couple of weeks would be difficult. Lastly, I reassured them that her pain would be controlled with pain medications. Snowie was able to return to RESQCATS the day after surgery. There was a long list of instructions, which I was happy to follow. In fact, I would have done anything for her to atone for her suffering. The volunteer who pledged a forever supply of tuna showed up every morning at 6:30 sharp to offer the aromatic treat Snowie loved so much. On days that she did not want to indulge in fish, she enjoyed Gerber’s chicken and gravy baby food. All the volunteers gave Snowie special attention with strict instructions from me. “Tell her that she’s beautiful without her ears.” I convinced myself that if they said that enough, I might also feel better about my own burden of guilt for what I had asked her to endure. As Snowie recovered, she appeared to look forward to the volunteers’ visits. During the next month, she healed both physically and emotionally. She craved attention and favored belly rubs. She was quick to roll from side to side in her basket as if to say, “Hey, you missed a spot!” She loved to be brushed. Her fur was as thick as a polar bear, so brushing sessions could go on indefinitely. Her stoic recovery was humbling. Little by little, I became accustomed to her new appearance. She looked like a baby white seal peeking over the edge of her basket. When she popped her head into full view, she reminded me of a white owl with jewel-like eyes. Once Snowie had fully recuperated, I opened her enclosure door so that she could mingle with the other resident cats. She had gotten along fine with them during her previous years at RESQCATS, but now she was cautious and avoided contact. Unfortunately, her reintroduction did not go well and I have never quite been able to pinpoint the reason. Some of the other residents saw her release back into the cattery as an invitation to intimidate her. They made it their sole mission to make her feel unwelcome. She became fearful of the other cats and retreated into hiding. She remained in the outside tunnels and hesitated entering the building where she could eat and sleep in a comfortable bed. When Snowie did come in, she could not avoid altercations. In the current set-up, she was doomed to a life of torment. I knew things needed to change when I found Snowie sitting in one of the exterior tunnels terrified to come inside the building. It was not fair for this sweet cat to be frightened all the time. So we constructed an indoor enclosure for Snowie. An overhead tunnel covered with shade cloth led to a private outdoor area built just for her. The enclosed space outside was constructed in the midst of several avocado trees that provided shade. Snowie thrived in her solitary space away from the other cats. She spent the warm summer days in an open basket watching birds and taking in the fresh breeze. She could watch the volunteers’ comings and goings from a place where she felt safe. On cold and rainy days, she slumbered in her basket with a heating pad in her inside enclosure. She was incredibly content! In the years that followed, Snowie required several more surgeries to remove additional pre-cancerous spots from her nose and forehead. As she got older, anesthesia presented a higher risk, so the veterinarian suggested some special creams as an alternative to surgery. Treating skin cancer became a routine part of her life. She required continuous monitoring and check-ups every six months. She accepted it with grace and understanding although trips to the veterinarian were always extremely stressful for her. Snowie captured the hearts of all volunteers over the years and each made a point to spend special time with her. My visits, however, were not something I talked much about. I felt fragile sharing my feelings of soft-heartedness and vulnerability with the volunteers. After all, I’m supposed to be the boss! I should be able to put on a straight face and handle all situations objectively with decisive strength. My outlook about exposing my extreme sensitivity was a result of my childhood. I often felt scolded for my feelings, “Jeffyne, you’re too emotional.” “You wear your heart on your sleeve.” “You’re too sensitive. People will walk all over you.” I perceived that being emotional was a character flaw. In my defense, I felt it was better to be cautious about sharing my innermost feelings with the volunteers. Fortunately, I have a much healthier perspective today. I realize my compassion and sensitivity is part of who I am…and I’m okay with it. The time I spent with Snowie was after everyone was gone for the day, when I could be myself. If I felt like crying, it was safe with no one around. I could speak to Snowie from my heart and hold nothing back. I told her that she was beautiful without her ears. I asked for her forgiveness. I had placed that burden on myself; it was not one that Snowie put on me. The quiet times we shared at the end of the long days gave me the chance just to be in the moment and breathe. That part of my day was something I looked forward to and treasured. I truly loved Snowie from the most vulnerable part of my being. Things changed suddenly on July 5, 2007 when I found Snowie on the ground in her outdoor enclosure. She had collapsed and could hardly breathe. I recognized the signs of heart failure. I rushed her to the vet where she was admitted immediately. Fortunately, the doctor was able to stabilize her. But we needed to know exactly what had happened in order to prescribe treatment. She had an ultrasound the next day and the results were not good. Snowie’s heart was failing. The condition caused her chest to fill with fluid, which made breathing difficult for her. She could have been prescribed three different medications twice a day to lengthen her lifespan. In addition, weekly follow-up trips to the vet to monitor her heart, kidneys and hydration levels would be required. None of this seemed fair. It was not fair for this to happen. More importantly, it was unfair to put Snowie through all this. Doctor visits had always been incredibly stressful because of her shyness. The increased trips to the vet could certainly send her back into her shell. According to the vet, Snowie’s remaining time on Earth could be extended. But I just could not imagine putting her through that emotional trauma in order to give her just a few more days…or weeks. We shared a special bond that had taken a very long time to develop. Treating her with medication with an inevitable outcome coupled with stressful vet visits would certainly destroy our relationship of understanding and trust. The regimen was not something I could bring myself to endorse for Snowie. Ultimately, her heart would still fail. If she went into cardiac arrest, she could suffer a dreadfully painful death. I could not envision that for her. I got up on the massage table and lay on lightly scented flannel sheets. Laura went to work, her hands gently kneading my body. She found all the pressure points and concentrated on releasing my built-up emotions and anxiety. I relaxed and fell deep into a tranquil calm. It felt as if I were floating. My thoughts turned to Snowie. Quiet tears filled my eyes. A few minutes later, a beautiful vision came to me. There is no doubt in my mind that it was real. I saw myself in a magnificent place in nature. It was calm and warm. There was green grass under my feet and birds singing overhead. A tepid breeze swept across my face. The sapphire-colored sky was interrupted with white, billowy clouds. A brilliant rainbow reached across the heavens. It was a bustling place with all species of animals in the distance. Bustling, yet peaceful. Some of the animals stopped when they saw me sitting on the grass. A few of them approached and gathered around me. I let them crawl onto my lap. I reached out my hand and invited them to nestle close. I gently caressed their fur. I could hear their serene murmurs of contentment. When I looked up, I saw Snowie in the distance. I was startled at first and questioned my sight. But there she was! And she saw me too! As she approached, I could see that Snowie did not have her ears. She could have gotten them back in Heaven if she had wanted them! But apparently, she felt fine without them…and had all along! ~Add something you would like to tell us just for fun. I love to dance! Disco! And I don’t need a partner! haha! ~Do you have any big news coming up soon? 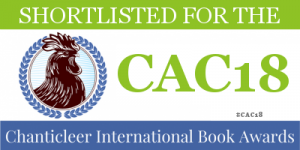 I just received an Award of Excellence from the Cat Writer’s Association for my book: “Cat Tails: Heart-Warming Stories about the Cats and Kittens of RESQCATS.” I have an interview with the local paper, The Santa Barbara NewsPress, scheduled this week. I also have a book signing and reading scheduled at Chaucer’s Book Store on July 12. Wonderful! 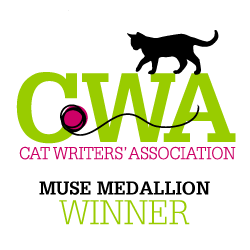 Winning a CWA Award of Excellence puts you in the running for the big prize, a Muse Medallion. Good luck! ~What is the best way to keep up with you? Thank you so much for your time and insights. Best of luck with your book and all your amazing cats. And a profound thanks for doing what you do! ~Sue Grafton…Cat-lover and International Bestselling Author of the “Alphabet Series” of Kinsey Millhone Mysteries. ~Wayne Pacelle…president & CEO, The Humane Society of the United States and New York Times Bestselling Author of The Bond and The Humane Economy. This entry was posted in Animal Shelters, Book Talk, CAT WRITERS and tagged author interview, cat books, cat shelters, cat stories, Cat Tails: Heart-Warming Stories about the Cats and Kittens of RESQCATS, Cat Writers Association, feel good stories, Jeffyne Telson, RESQCATS, Santa Barbara, Sue Grafton. Bookmark the permalink. It was a powerful interview. Thanks for your comment. Miss Jeffyne truly found her calling in life and I think her from the bottom of my heart for all she has done for kitties over the years. Her chapter about Snowie put Mom to tears as it was so heartfelt. And CONCATS to Miss Jeffyne for her CWA award! Purrs. Yes, her story touched me too. So glad there are people like her for cats.